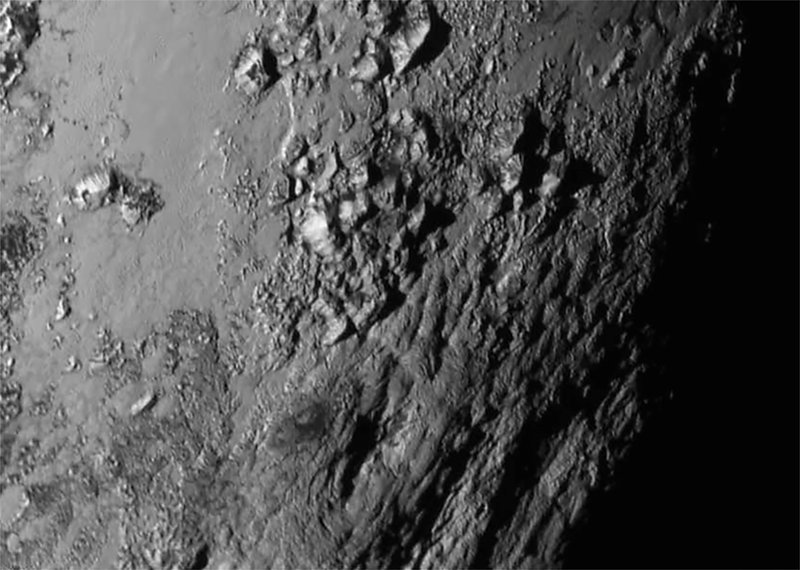 Enormous ice mountains discovered on Pluto. Credit: NASA/Johns Hopkins University Applied Physics Laboratory/Southwest Research Institute. At 3 p.m. EDT today, July 15 2015, from the Johns Hopkins University’s Applied Physics Laboratory in Laurel, Maryland, the New Horizons team revealed to the world the first high-resolution image acquired of the surface of Pluto. This was obtained during the historic July 14 flyby with New Horizons’ “Ralph” camera, and it’s our very first close-up view of this distant world’s fascinating, beautiful, and surprisingly crater-free surface! Of course more will be coming as the days, weeks, and months pass, and many further studies will be done to determine the nature of all of the features revealed, but for now – enjoy. This is truly an amazing time in space exploration! 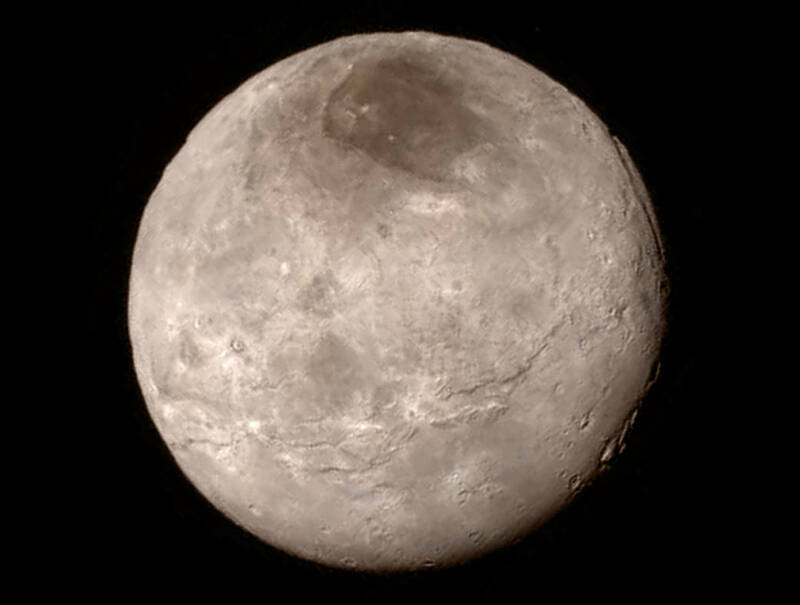 In addition to the icy mountains of Pluto, New Horizons returned a high-res image of Charon acquired the day before the flyby. It also reveals a surprisingly youthful surface, with cliffs, chasms, dark “stains” and bright reflective regions. Pluto’s moon Charon, imaged by New Horizons on July 13, 2015. Credit: NASA/Johns Hopkins University Applied Physics Laboratory/Southwest Research Institute. 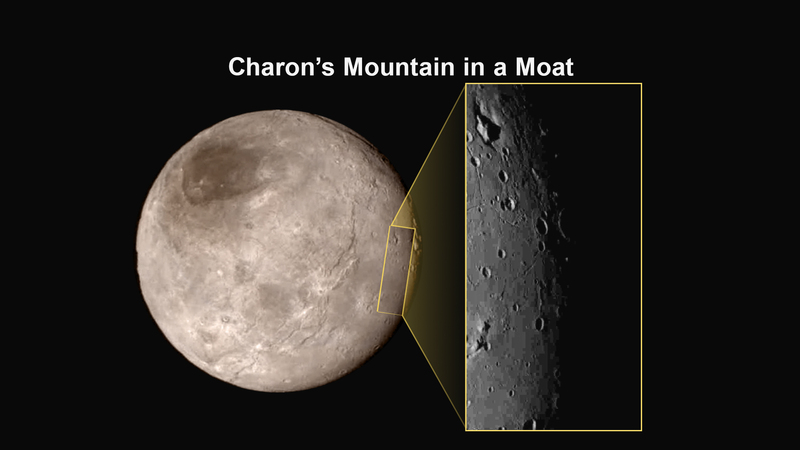 UPDATE 7/16: Here’s our first close-up (but heavily-compressed) detail of Charon, showing what resembles a “mountain-in-a-moat” (upper left in detail.) Nobody’s storming that stronghold! So as one of the first humans in history to see these worlds close up, what do you think? Is Pluto at all what you envisioned? More? Less? Share your thoughts in the comments! Here’s Principal Investigator Alan Stern seeing these images when they were coming in! Follow the latest news from the New Horizons mission here. Previous Post Share the Pluto Love! Proud thoughts are swimming in my mind. It is wonderful, for I have only ever seen drawings or artists impressions of Pluto.